The Goodman GMVC80805CX is a variable-speed gas furnace with ComfortNet compatibility. It uses a powerful, aluminized-steel dual-diameter tubular heat exchanger. It is housed in a fully-insulated heavy-gauge steel cabinet with a durable baked-enamel finish. A variable-speed ECM circulator motor operates gently and quietly to adjust to temperature demands. 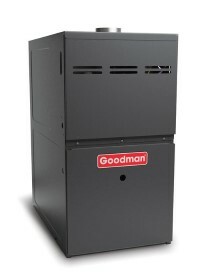 This Goodman gas furnace is a two-stage, variable-speed, multi-position heater. It's compatible with both two-stage and single-stage thermostats. It uses a durable Silicon Nitride igniter to maintain a comfortable temperature in the home. It has a heating capacity input in high mode of 80,000 BTU and output of 64,000 BTU. In low mode, this unit has a heating capacity input of 56,000 BTU and an output of 44,800 BTU. This heater comes from the GMVC8 line of Goodman gas furnaces. This collection of Goodman gas furnaces has up to 80% AFUE (annual fuel utilization efficiency) rating. Many standard furnaces feature 60% AFUE, which means that this system can contribute to significant energy savings. This unit is a Low NOx model of the GMVC8 gas furnace. This multi-position Goodman gas heater offers many installation options. It can be installed in upflow or horizontal positions. This model features a low constant fan speed to keep air circulating throughout the home and has a self-diagnosing control board.